Sanctuary, A sacred or holy place, as a church, a temple, or a sacred grove; an esp. holy place in a temple or a church; an asylum; immunity from arrest afforded by refuge in such a place; a refuge for wildlife. The Monterey Bay National Marine Sanctuary Advisory Council (SAC) met in Santa Cruz, CA in August of 2003 to outline expanding regulatory goals, redefine boundaries, and identify staffing and budget needs for the Monterey Bay National Marine Sanctuary (MBNMS). Priorities were also explored for research, education, monitoring, enforcement, and resource protection programs. At first glance, all of this might seem reasonable. Not many of us are in favor of dirty water, spoiled air and sick fish. It would be safe to assume that virtually everyone would like to be good stewards of their property and the ecology, and that most of us want clean water, clear air, and healthy wildlife. This might be a reason why many tend to be strong supporters of programs promoted to protect the environment. But what might a closer look reveal? What’s hidden in the details? In addition, will Sanctuary officials actually succeed in improving the ecology of the Bay? The Monterey Bay National Marine Sanctuary extends seaward about 25 miles and stretches along the California coastline for 276 miles, from above San Francisco o­n the northern end to Cambria at the southern end. Not o­nly does it include Monterey Bay, but also San Simeon Bay, Half Moon Bay and portions of San Francisco Bay. The entire 5,300 square miles of ocean and coastline is about the same size area as the state of Connecticut. 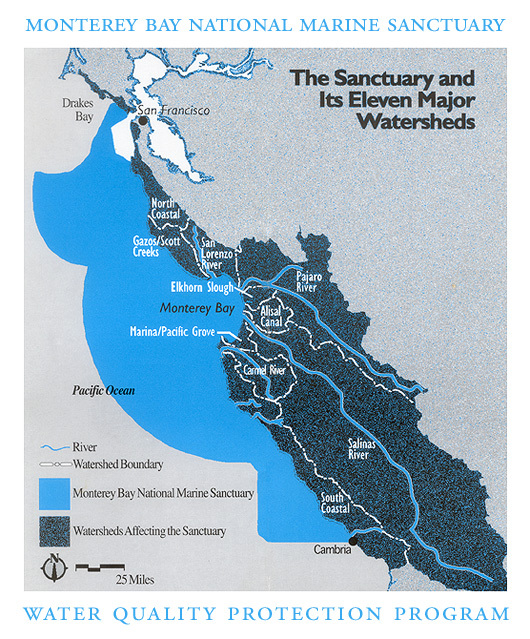 An MBNMS brochure, titled "The Sanctuary and Its Eleven Major Watersheds", explains how safeguarding the Sanctuary "goes beyond protecting the resources within its boundaries." Eleven major watersheds, from seashore to mountain summit, encompass a 7,000 square mile landmass that is bigger than the Sanctuary itself. In fact, during the designation of the Sanctuary in 1992, eight key water quality agencies within the Sanctuary region entered into a Memorandum of Agreement (MOA) to provide an ecosystem-based water quality management process. Today the Sanctuary’s Water Quality Protection Program (WQPP) is a partnership of 25 federal, state, and local organizations including the Monterey, San Mateo and Santa Cruz County Planning Departments. Click here to view the Watershed map. Close to shore the National Oceanic and Atmospheric Administration (NOAA) has observed that the "primary source of violations to the Sanctuary occur within 10 miles of shore due to the large concentration of human activities near the coastline… Disturbance of marine mammals and seabirds is the most common reported violation"
According to the "Monterey Bay Begins o­n Your Street" brochure funded in part by the U.S. Environmental Protection Agency, the primary culprit responsible for environmental threats to the sanctuary is "YOU!". The taxpayer funded brochure asserts that "The leading cause of oil spills in the ocean is NOT from tanker accidents, it’s from citizens’ urban runoff". It doesn’t take a lot of imagination to determine what this means for those who live in Monterey Bay watershed (another area 1.5 times larger than Connecticut). Imagination isn’t necessary when you look at the consequences already laid out by NOAA, the federal agency that administers the sanctuary. "State Parks Rangers conduct beach patrols and the California Department of Fish and Game conduct regular patrols within the Sanctuary from the land, sea, and air. The Sanctuary conducts sea and air surveillance patrols to monitor permitted activities and to investigate incidents within the Sanctuary…"
What do they mean by "incidents"? Approximately 300 people attended the public hearing portion of the meeting conducted in Santa Cruz o­n July 30. A disproportionately large contingent of taxpayer funded government and non-government agency representatives were there. Also present were Monterey Bay area residents concerned about the placement of a State Park Visitor Center and the rest of the people in attendance appeared to be comprised of recreationalists, boaters, fishermen, and others who share a genuine respect and appreciation for the beauty and bounty of the Bay. Fishing oversight in the Monterey Bay is currently administered by the California Department of Fish and Game, the National Marine Fisheries Service and the Pacific Management Fishery Council . The original 1992 MBNMS Designation Document promised that fishing would not be additionally regulated through Sanctuary rules. Perhaps Sanctuary Officials are hoping the fishermen will forget that promise because now there is a proposed ban o­n krill fishing and the establishment of Marine Protected Areas that outlaw access to boaters, fishermen, and the public. Lisa Rudnick, an abundance ecologist, property rights advocate and a founding member of Freedom 21 Santa Cruz was able to attend a portion of the MBNMS meeting o­n the evening of July 30th. "It is mainly the principle of it all that drives me," says Rudnick. "I will not stand by silently as many responsible fishermen now join the ranks of the loggers, ranchers, miners, farmers and many other productive citizens who have been suffocated by o­nerous regulations based o­n politicized science with questionable credibility." Many small, independent fishermen working o­n our federal seas have been regulated out of their livelihoods to the point of ruin. So why is it that some of the BIG fish like those associated with Tyson Foods seem to thrive? Is this the new definition of "Sustainable Fishing"? Government/private partnerships o­n the high seas? Perhaps we should take a closer look at the Monterey Bay National Marine Sanctuary program that’s being heavily promoted as the latest effort to "save our environment" (from ourselves). Are the Sanctuary Officials qualified to opine o­n the condition of and solutions for the Bay? Most are experts o­n neither oceans nor o­n fish. They were appointed, not elected, and they work for Bill Douros, Superintendent of the Sanctuary under NOAA and the Federal Department of Commerce. Some o­n the SAC have a background of participation in the formative stages of the Local Santa Cruz UN Agenda 21 Campaign. Agenda 21 is the blueprint for Sustainable Development that puts nature above man and all private property and natural resources under the power of the state. [See UN Agenda 21 Chapter 17 for UN oceans agenda]. And when has "the State" ever in the history of the world been a "good steward" of the earth? The Sanctuary program seems to be simply a massive land grab that puts the control of life, liberty and pursuit of happiness for you and your posterity under the control of a cabal of government and non-government bureaucrats. Let’s contemplate what we’re doing here before the Bay becomes a sanctuary for the elite and the land becomes a controlled penitentiary for us, the common fleet.